I often drive when we are traveling for my son’s games; it gives Dee a break from driving (he drives for a living), and I appreciate the words the Lord gives me in the car. A week ago, was no different. I completed my normal check, weather looked good, a little snow fall, but nothing major. I also checked my GPS to become familiar with the route (I am a planner by nature). GPS gave me two different routes I could take, one going through Ohio, the other through West Virginia. Was there a nudging of the Holy Spirit prompting me the direction to take? Hmmm. Normally, I avoid West Virginia routes if all possible, as I do not care driving through the mountains. Through WV, however, it was saving me 17 minutes…I am LOVING THIS!!! So, through West Virginia it is. The ride was rather smooth, but out of nowhere, snow immediately fell, making the roads extremely slick. It was mind boggling, scary even, like where did this come from. It came so quickly, it was hard to get my thoughts together. Of course, I slowed down and at one point was going 35mph on I-64 (YES on the highway)! Dee noticed the concern in my eyes and asked if I wanted him to drive. I took a deep breath and before I could respond, I heard from the Lord! He said, I called you to go through! OUCH! I told Dee, thank you, but that I would continue driving. You see, we get so caught up in what we think we know (especially when things appear the same), listening to others (the GPS), the normalcy/scheduling of our lives, we are no longer in the position to hear God’s voice. 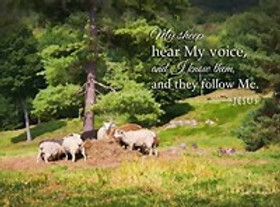 He said, “My sheep hear My voice, and I know them” (John 10:27); but we must be in position to hear. I had a nudging of the Holy Spirit, but when we are surrounded with the busyness of life, distractions, or full of ourselves, it makes it difficult to hear the voice of the Lord. But He will often send whatever necessary to get the focus off of ourselves and back into fellowship with Him, so we may obey. I very well could have taken Dee on his offer, but when God spoke to go through, it reminded me that everything which occurs in my life, He is the One who goes before me (Deuteronomy 31:8). Even when I do not fully obey His commands. If God has gone before me where I go, what or why should I fear? Really. What can happen in my life, that God allows, can harm me...NOTHING! I/you/we are in His care! Sure, just like the condition of the travel, when we do not heed to the Holy Spirit, there may be obstacles along the way, that you do not expect, and can be difficult. There are going to be times where life will hit you suddenly and come like a storm. It may even seem as though you cannot see your way out or through. AND, it may last much longer than you anticipate or like. God never promised a life of simplicity, but He did promise He would be with us till the end of the world (Matthew 28:20). It was only through the comfort of the Holy Spirit (John 14:14) was I able to make it through and my nerves intact. On the highway AND in life! Remember at the beginning, I mentioned this route was saving me 17 minutes? Going the suggested shorter route is not always the best route. We must always make sure the route we are taking is in God’s plan and not our own. Broad is the way that leads to destruction (Matthew 7:13). Now I am not saying I took the wrong way, I followed the GPS. If there were multiple people near my home, but in different areas, it would have given them the same route, cause it “appeared” to be the quickest. The “everyone’s doing it”, the broad way! When traveling in life, wait on God to speak, don’t be in a rush; don’t get caught up in the busyness of life where you will miss God talking to you. Take time, seek after Him, allow Him to speak back. Abide in Him! Where ever it is you are going to, when submitting yourself unto Him, He will get you there. He will see it to completion (Philippians 1:6). The time I initially thought I would be saving, (17 minutes) I did not. As a matter of fact, it took us longer to reach to the destination. You know, listening to God and obeying Him is valuable. He is here and available if we just trust Him and obey. He sees where you are and where you are going. He is the Alpha and the Omega, the beginning and the end. Who is better to listen to than the One who is ALL KNOWING! !